The Walmart here restocked the Samurai Turtles. Probably pick them up at some point for our son before his birthday in April. So interestingly I was at the local walmart and noticed a Usagi figure. I already have one, from a different walmart, and it was the only new figure there. I check the pegs and they've restocked the repaints with eyeballs wave, still have some of the monster hunters and then 4 usagi on a peg with nary a sign of any other Samurai turtles. I'm really wondering about the wave/distribution for these last figs. My local Walmart is restocking the turtles in the new totally turtles packaging. They are just the turtles figures with the repainted eyes as well though and the samurai turtles have vanished. The Ghostbusters figures are Target exclusives. i don't know if we will actually see them in Canada. Check your local comic shops! 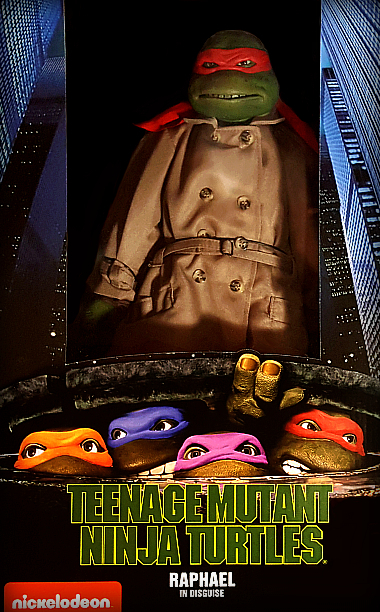 Local shops here in Ottawa have been receiving NECA's 'Raph in Disguise' at a price that doesn't break the bank. I picked one up a few days ago... the first four, I acquired last year from the US because they were asking almost $300 CAD here which while they're amazing figures, is still a crazy price. The last Playmates/Spin Master figures I picked up were Usagi and the Samurai TMNT. I swore I wouldn't purchase anymore but I really liked how those turned out, even with a few missing paint apps. I haven't posted on the drome in a long while... I'll try to change that. just need one more leo to finish on my "maybe opening set"
just need one more super shredder mikey - picked up the others from toysrus actually.